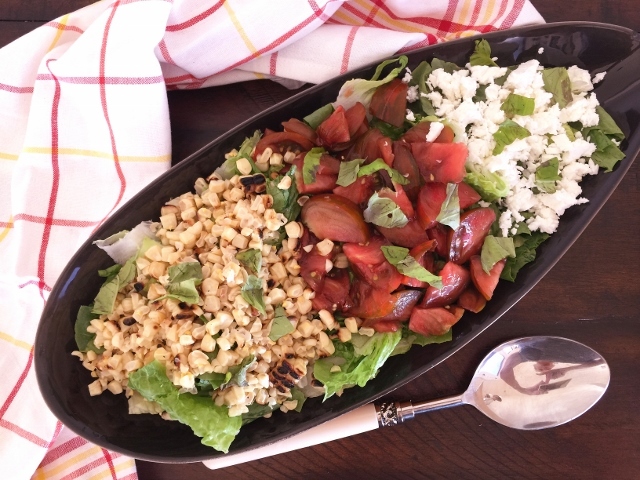 Tomato & Corn Salad with Basil Vinaigrette - Recipe! - Live. Love. Laugh. Food. 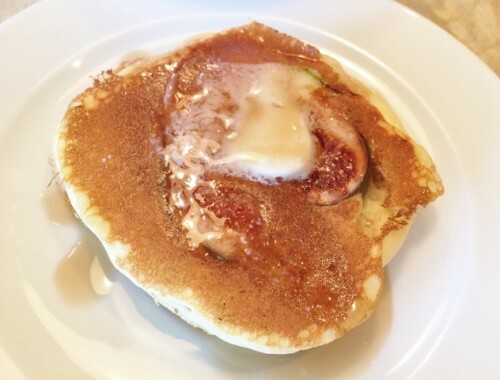 Fresh corn season is upon us and it is one of my husband’s favorite foods, and I just happen to love tomatoes. The combination of the two make the best salad and this is one recipe you cannot miss this summer. Fresh corn is available almost everywhere over the next few months, and there are a few different varieties. I tend to prefer white corn because I think it is slightly sweeter than yellow corn, but it depends where you buy it. When I was a kid we would grow corn in our backyard just as a fun summer experiment. I remember anticipating the day that we could actually pull the cobs right off the stalks, and my mom cooking them up in our favorite recipes. The corn was always so amazingly sweet and juicy, just like I imagined it. 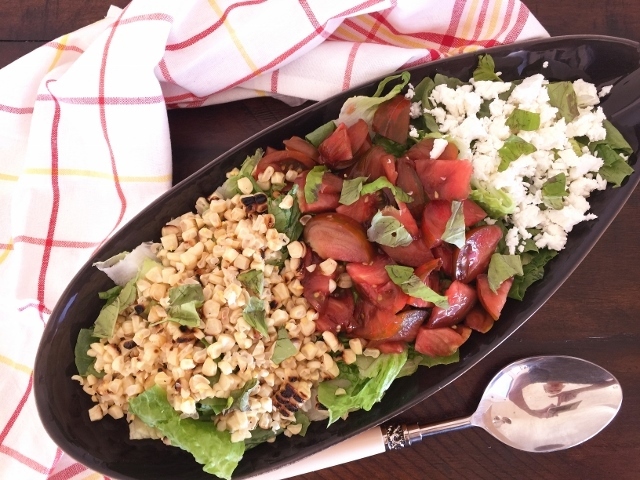 This salad would be great with a drizzle of olive oil, but the vinaigrette in this recipe adds so much more – an aromatic boost because of the fresh basil, which pairs nicely with the tomatoes and corn. A little feta cheese adds a mild salty twist and I prefer to use a block of feta and crumble it myself because the flavors are a little more intense and fresh. You can make this recipe ahead and toss it with the vinaigrette right before serving. It makes a great picnic salad because it can handle being stored in a cooler for a few hours, and it tastes great as a side dish with burgers, hot dogs or grilled meat. 1. 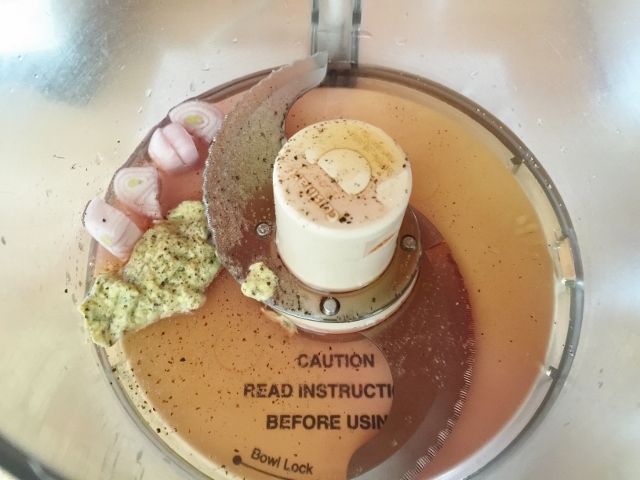 In a food processor, add vinegar, shallot, agave, mustard and a pinch of salt and black pepper. 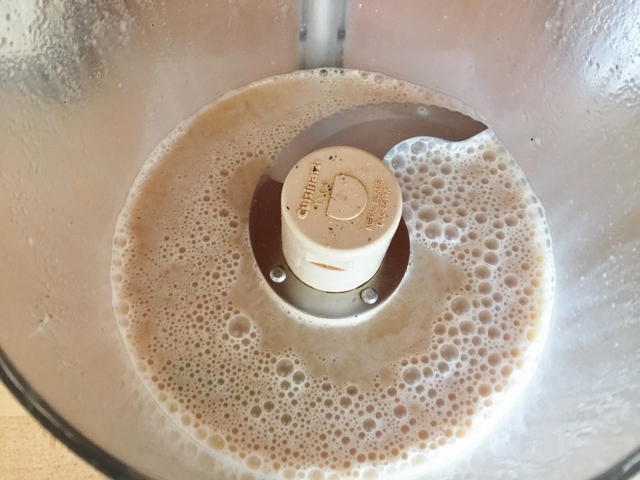 Process mixture for 1 minute, or until slightly frothy. 2. 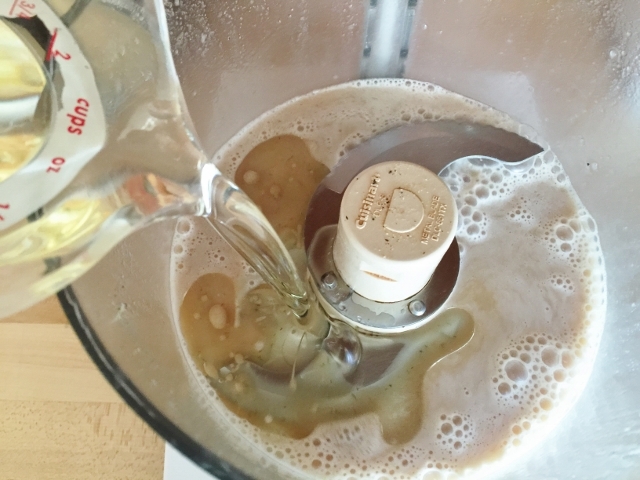 Add sunflower oil to vinegar and process. 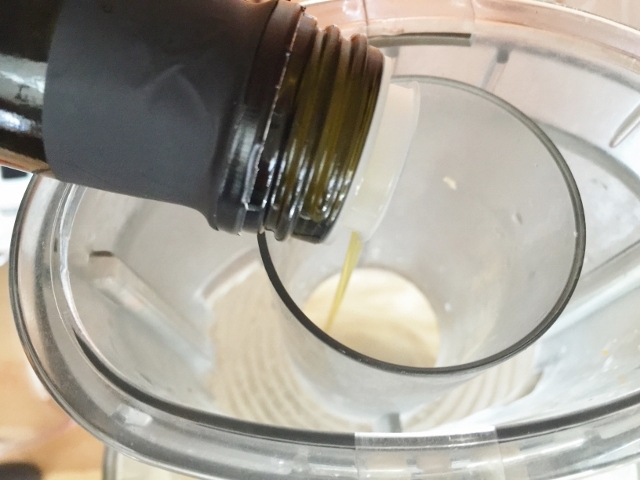 While still on, drizzle in olive oil and process for another 30 seconds until combined. 3. 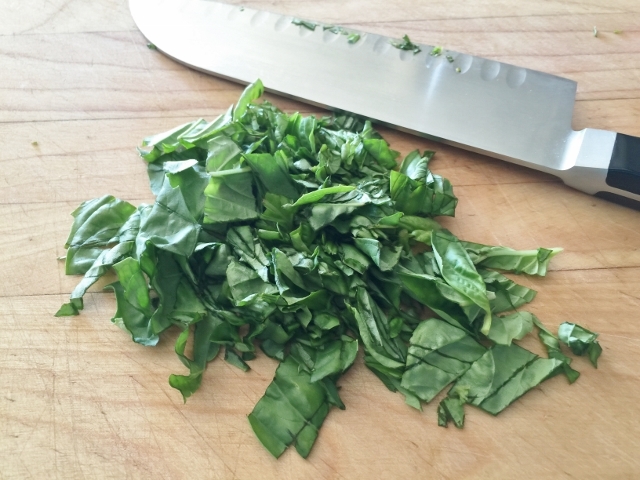 Rough chop basil leaves and add them to vinaigrette. Pulse mixture for 30 seconds until basil is in smaller pieces, but not pureed into vinaigrette. You don’t want green dressing. 4. Turn grill on, or if using a grill pan on stove, preheat grill pan to medium-high heat. 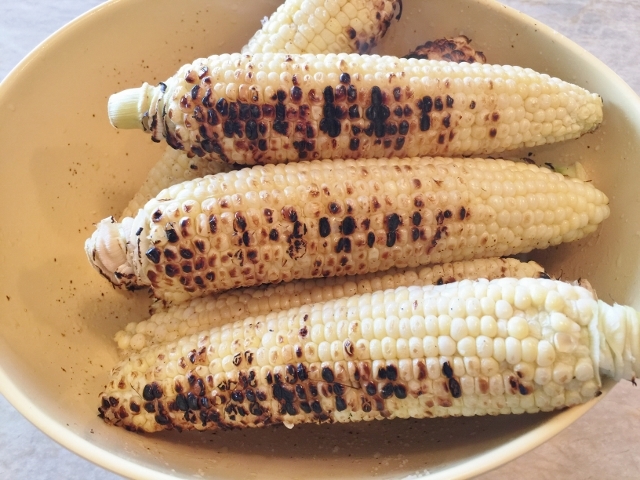 Husk and wash corn and toss with olive oil and a little salt. 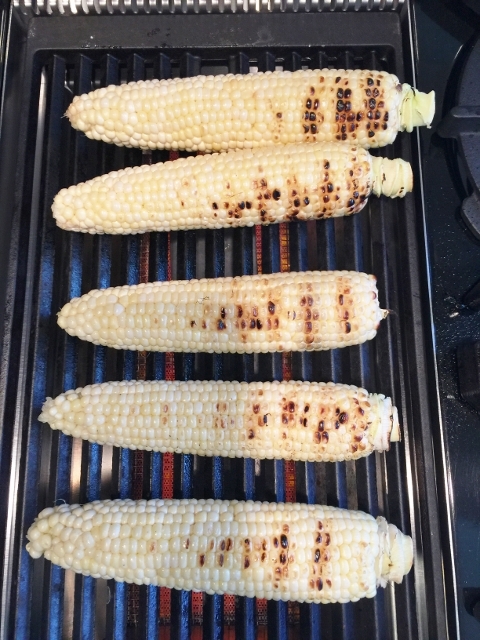 Place corn on top of grill and cook until kernels are slightly charred in some places, about 10 minutes. 5. Remove corn and place it in a bowl to cool. 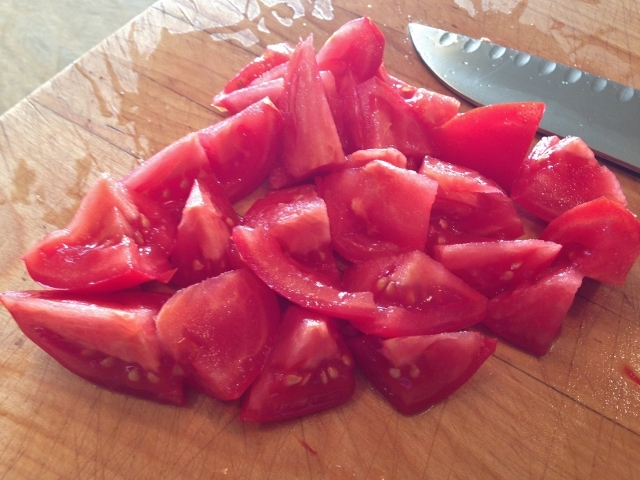 Slice tomatoes into bite sized chunks, or if using cherry tomatoes, cut in half. Layer lettuce on bottom of platter and slice kernels off cob, layer them on top of lettuce. Add tomatoes and sprinkle feta and torn basil leaves over the top. 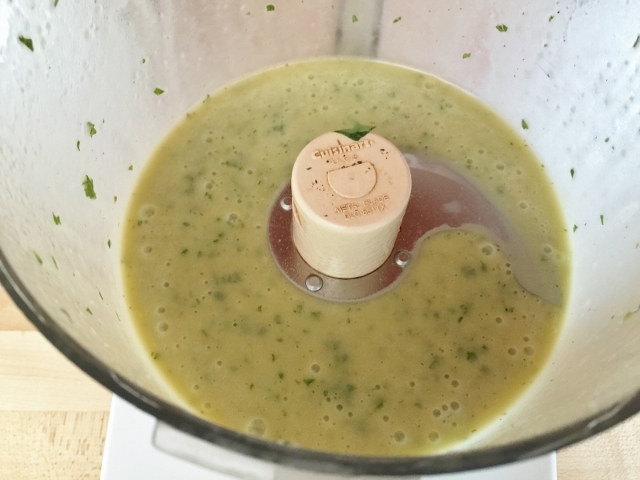 When ready to serve, toss with Basil Vinaigrette. Enjoy! 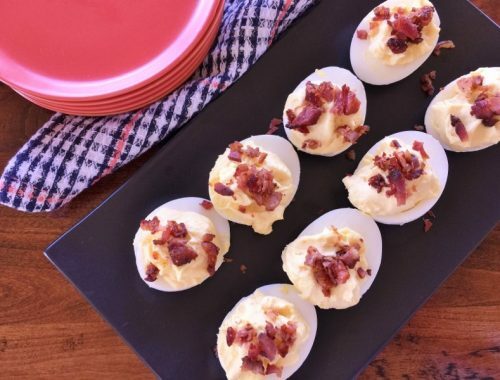 Deviled Eggs with Goat Cheese & Bacon – Recipe! 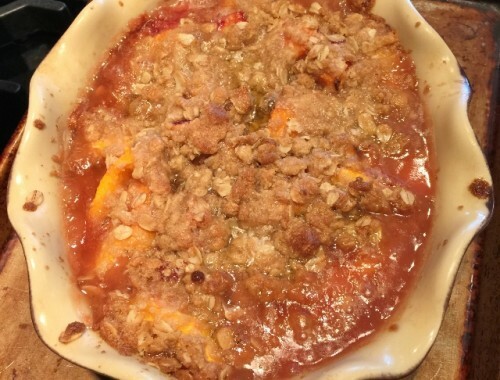 Fresh Peach Crisp – Recipe!